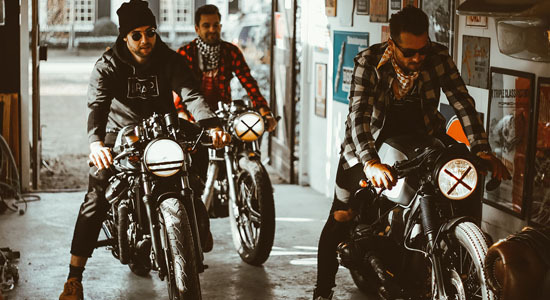 In a short period of time, husband and wife Max and Erica of Droog Moto were able to create custom bikes with a real authentic signature. 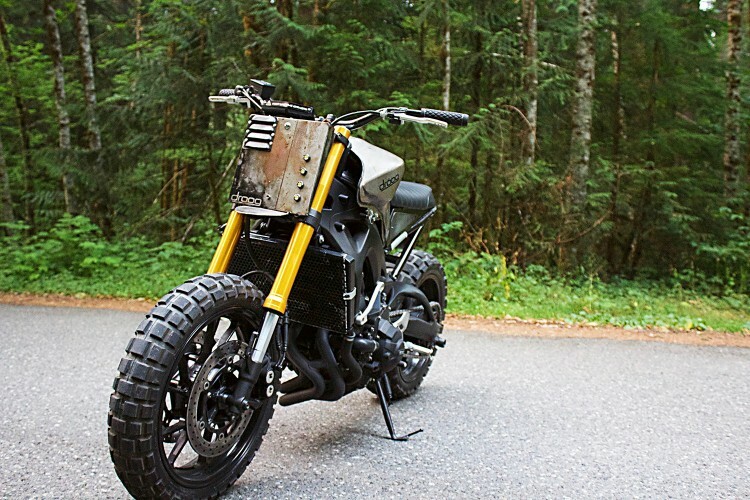 All their creations have a cool, raw industrial look and look like they are directly taken from The Walking Dead. 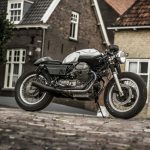 Take a look at some other builds we’ve featured here. 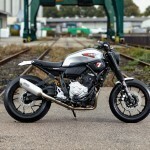 Their latest build is based on the Yamaha MT-09. Since the introduction of the MT-9 (or FZ-09 in some regions) back in 2015 it got a lot of positive reviews from all around the world. 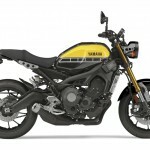 It was especially the all new triple cylinder engine and the high standards of the MT-09 that gave the bike credit. 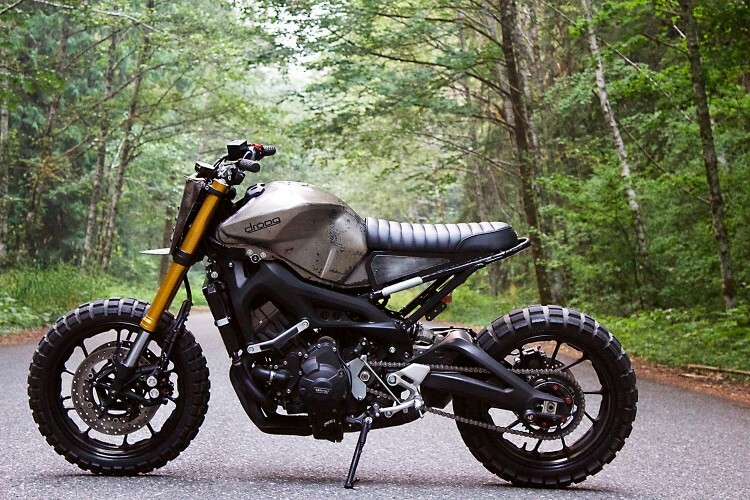 This awesome MT-09 Scrambler sure got that cool Droog Moto touch. Personally, I’m a big fan of their work and I’m happy to feature another build by Max and Erica. 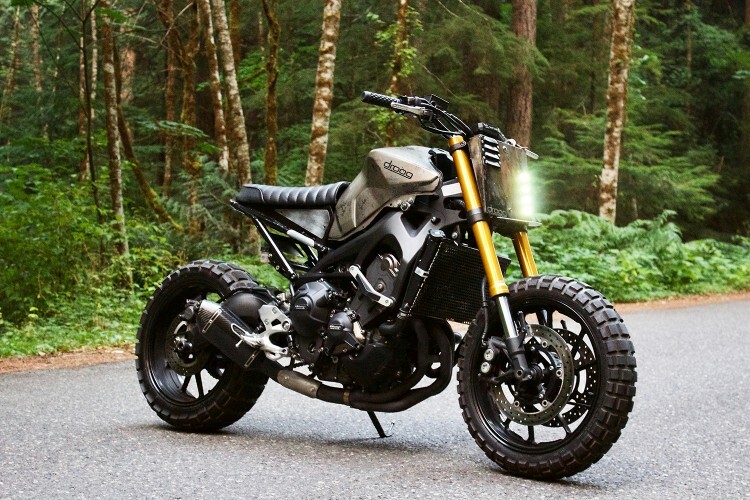 This bike started as a completely stock 2014 Yamaha MT-09. 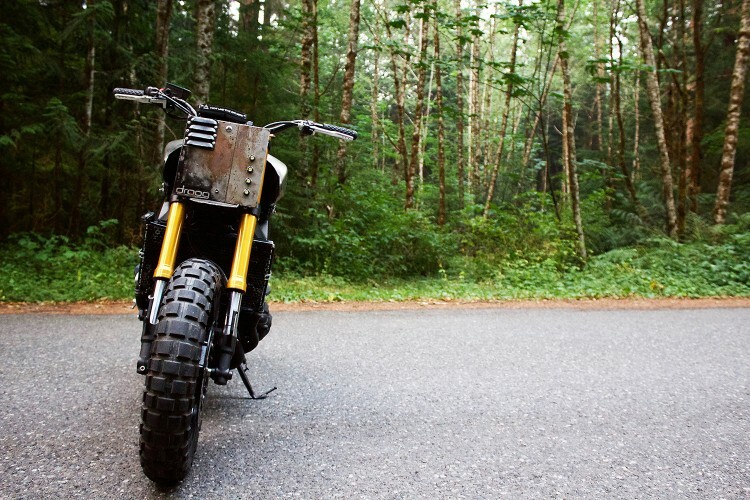 The bike has received so many amazing reviews and we knew that the bike had a killer platform to build off of. We didn’t really know what direction to take this one so it has continued to evolve over the last year. 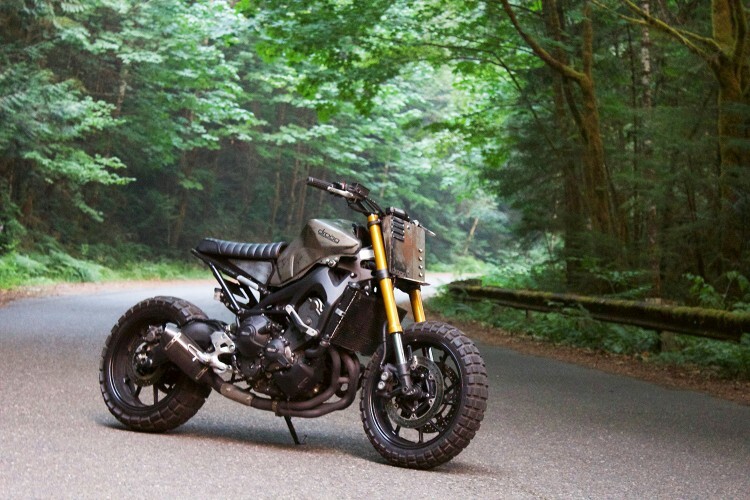 The 3 cylinder 850 was another reason why this one has become one of our favorites! The first concept of the build was more tracker than anything and really wasn’t what we were after. 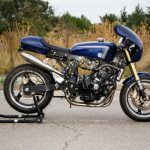 We knew we wanted the bike to be aggressive and tough in appearance so we got rid of the stock subframe and fabricated our own and did something different than just a generic tube hoop. 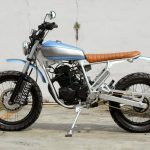 We went with a solid style construction which also conceals the electronics and battery and then went with a short style brat seat. The tail/brake light is integrated into the rear to keep things clean. The gas tank was stripped down to raw and given the Droog Moto treatment and we did away with all the bulky unsightly plastics. We had gone through a few different tracker plate ideas and finally settled on the one you see now. We wanted it rough and aggressive looking. We opted with 4 small LED lights that are extremely bright at night and a small front fender. The speedometer was also relocated to the tracker plate to give it a low and sleek appearance. The wheels were re-powder coated black and then we wrapped them in a set of chunky TKC80 tires. The TKC’s are an awesome option for anyone who does commute on pavement but also wants a good off road savvy tire. They perform extremely well in corners and off the beaten path! We went with a carbon style pipe on this bike which sounds amazing and is nice and light as well. This bike is a freaking blast to ride. You have the posture of a super-moto but the engine of a sport bike. The triple is one of the best sounding engines we think and is an amazing power plant for this particular build. We are sure this bike will be ever changing as the company grows but we finally got it to be one of our favorites. 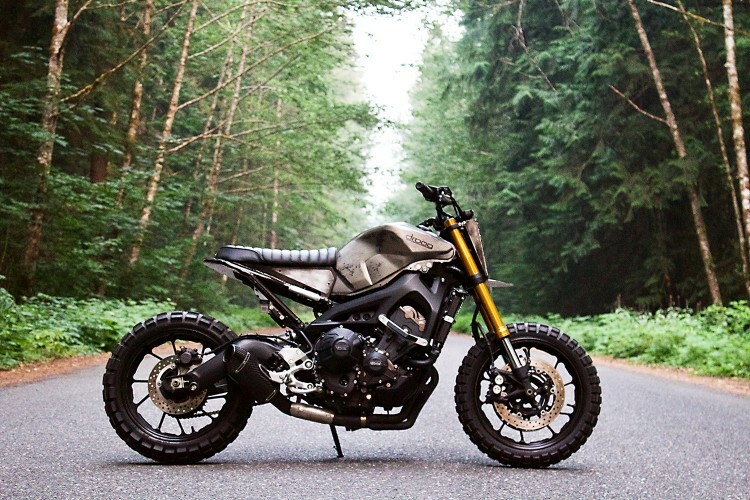 This MT-09 Scrambler is for sale! 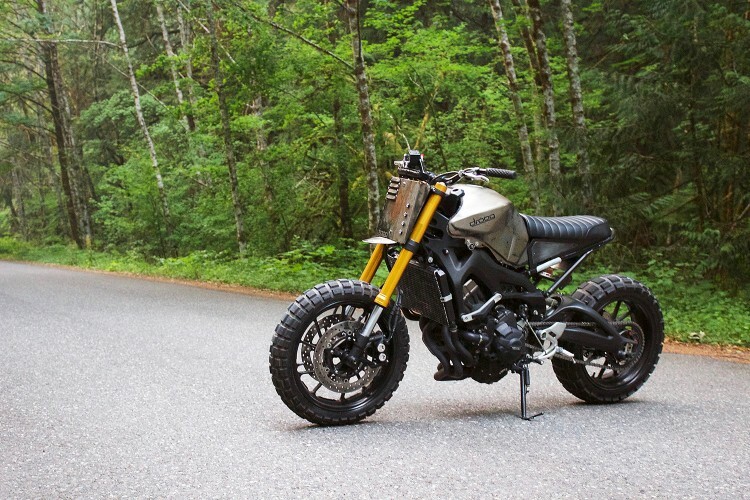 We are doing a limited 3 build series on this MT-09 Scrambler. 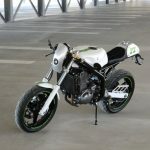 It will consist of three MT-09 donor bikes that will match our bike but each will be unique to their own. We have more info and details about that on our website as well! 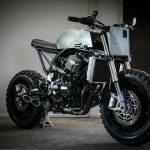 This build series will offer people to each get their own custom and unique MT-09 that no one else in the world will have. You get the amazing power plant 3 cylinder engine with a rough and ready type of ride.